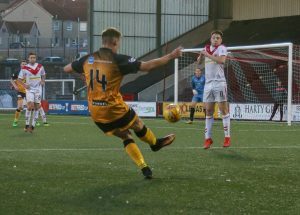 Airdrieonians scuppered any chances Annan had of making the play offs when they convincingly defeated the Galabankies on Tuesday evening. The match that took a dramatic turn in favour of the home team after Annan lost the services of regular keeper Alex Miller who clashed with Leighton McIntosh resulting in both players having to leave the field in the 30th minute to get stitches. The Young Annan replacement keeper Robbie Minto had barely taken his place between the sticks when Airdrie skipper Sean Crighton took full advantage of the retreating Annan backline. A good run across the edge of the box by Kieran MacDonald in 38 minutes was followed by a lay-off to Crighton who took a couple of steps and struck a 25-yard effort that took a deflection on the way past Robbie Minto into the bottom corner of the Annan net. Annan had a chance to level matters on 42 minutes, but Scott Roberts shot from 20 yards out lacked power and was easily gathered by Gallacher. It was the only goal which separated the teams in the first half with neither of the keepers being seriously tested. An excellent mazy run by Grant Gallagher nine minutes after the restart saw the midfielder dumped on the edge of the box after a poor challenge by Sonkur and Ryan Conroy made Annan pay after he curled the free kick around the wall into the net to double the advantage. Two minutes later Dale Carrick chased Millar’s ball down the right, giving himself room to cut the ball back for Duffy who fired a powerful shot beyond Minto for his third goal in three successive Betfred ties this season. Aidan Smith attempted to reduce the margin for Annan on 59 minutes but his curling shot was well taken by Gallacher. The Airdrie keeper was also equal to a header from close range by defender Ayrton Sonkur, taking the ball low at his right post. Annan worked their way back into the game Tommy Muir and Aidan smith combined with Scott Gallagher saving Smith’s effort. Scott Roberts header in the 70th minute tested the Airdrie keeper. It was a good spell from Annan and in the 80th minute a good penetrating break from the middle of the park from substitute Tony Wallace set up Aidan Smith who smashed the ball over the bar. David Wilson scored the goal of the game for Annan in the 83rd minute with a superb 30 yard effort which sailed into the top corner of the net past keeper Scott Gallagher. Airdrie however had the final say on the match when Dale Carrick turned Peter Watson on the edge of the box to finish with a low shot into the corner of the net past Minto. However, the home support rose to their feet two minutes from time after Carrick controlled a strong cross into the penalty box with his back to goal eluded the challenge of Peter Watson with Carrick turning Watson to finish with a superb volley into the net for goal number four on the night for Airdrieonians. The result leaves both Hamilton and Airdrieonians in with an opportunity to progress as runners up to likely winners Livingston who play Berwick in their final game on Saturday. Annan are without a match on Saturday and will face a much needed break after playing 2 matches in consecutive weeks. Airdieonians – Scott Gallacher, ,Sean Crighton .Scott Robertson, Kieran MacDonald, Jonathan Page Grant Gallagher (Kyle Wilkie 65 min), Kieran Millar,Scott Robertson, Ryan Conroy, .Joshua Edwards, Darryl Duffy (Cameron Russell 65 min) , Leighton McIntosh (. Dale Carrick 30 min) Josh Edwards Subs not used. Chris O’Neil,.David Hutton, Dean Cairns. Annan – Alex Mitchell ( Robbie Minto 30 min), Scott Hooper, James Creaney, David Wilson, Ayrton Sonkur, Peter Watson, Aidan Smith ,Ryan Sinnamon ( Owen Moxon 67 min), Tommy Muir, Scott Roberts Chris Johnston (Tony Wallace 62min). Sub not used Peter Murphy.